EDIT ON 11/13/2009: I've had a lot of people ask where I got this stencil. I got this particular one from a scrapbook fall package from years ago. 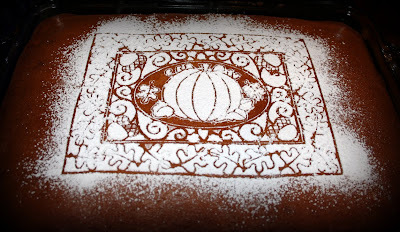 Embellish your favorite fall dessert with powdered sugar and a stencil! It is super easy and extra cute. Just press your stencil firmly yet gently onto your cake/bread and shake the sugar all over. Carefully lift the stencil and Ta Da, beautifully done! This is a Pumpkin Ribbon Cake that I make each season. It is moist pumpkin with a thin ribbon layer of cream cheese. I use a Pampered Chef recipe. You can easily use your favorite pumpkin or spice cake recipe. Then for the ribbon layer simply mix 8oz softened cream cheese (I use light) with 3/4 cup sugar on high speed. Spread the cream mixture on 1/3 of your cake batter in the pan. Spread the remaining batter over the cream mixture and bake as your recipe directs. The boys couldn't get enough of this dessert breakfast! Please don't eat for the rest of the day, these calories will last you awhile. Both of these recipes are found on (my favorite!!) at AllRecipes.com. that cake looks so moist! im craving a piece right now! How yummy! That is a beautiful stencil. I just love pumpkin and am always looking for new recipes! That cake sounds, and looks so yummy! Love your stencil, Lisa! Where did you get that!? The recipes sound divine! I'm always looking for new fall ones! 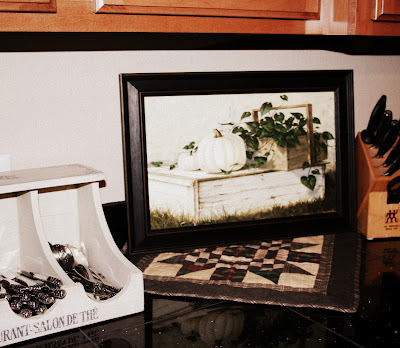 And I love your fall kitchen display! My mom used to use the stencil trick on melktert a fabulous South African dessert-my favourite thing that she made. It was so pretty and so is yours! Thanks for the happy memory. Those recipes sound blissfully decadent. My mouth is literally watering. My diet is quaking.. It's almost too pretty to eat. Almost is the operative word! 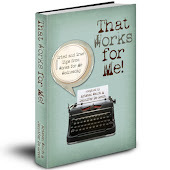 Just found your blog and am I glad! The cake looks delish and I will definitely try it. Yummy! Your food posts just about kill me! They always look so good. Seriously why can't you live close to me so I can eat all your goodies! They all look soooo yummy! Hello! Just stumbled across your blog. I love the stencil and would like to know where you found it... if you can share. Oh my goodness, that looks AMAZING! You did a great job on the cake. Love your fall decor. Love the stencil idea! That is brilliant! Pancakes are my husband's favorite breakfast. I'll try these and the syrup. Thanks for sharing. 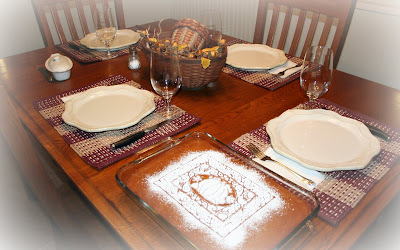 I love the powdered sugar and stencil design, very simple but looks great! Clever and lovely idea. Thank you for sharing it! Mmmmmmmmmmmmm............that looks yummy........and BEAUTIFUL...How clever. I could even do this. Your fall counters are lovely too. cool, but where do you get the stencil?? I love the stencil! Anything pampered chef is good in my book. In fact this coming week I am going to a pc party. Lets say damage will be done. I love the powdered sugar stencil. Such a cute and simple idea to spruce up a dessert. Ohh! That pumpkin cake looks great. I want to give that one a try. I am all for anything that is this pretty and easy. Where do you buy your stencils! The cake and the syrup look divine! The cake is beautiful! What a perfect dessert. Thanks for stopping by and commenting. A thankful heart must be cultivated-it does not usually come naturally to us! Blessings. That cake is a work of art, and looks luscious to boot! 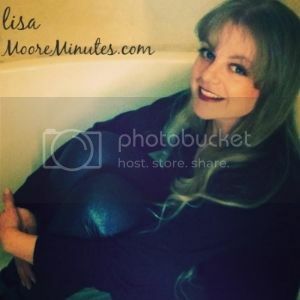 Lisa, that stencil idea is as clever as can be! Love it! And it has the added advantage of being powdered sugar... you can put that on just about anything, and I love it, and these all look delicious AND pretty. I love pumpkin anything! What a beautiful way to dress up a dessert! It looks like a work of art with the stencil. I always forget to take out my pack of Martha Stencils. Thanks for reminding me. Oh Lisa I'm getting hungry looking at all of your lovely goodies. Yum! I'm not sure if that is the lake you are speaking of. Hmmm? Is there anything you can't do you domestic goddess? girl...that is the best idea ...a stencil...I never would have thought that!!! have a great weekend if I don't get back here before! 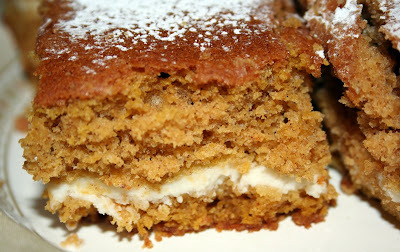 My mouth is watering for a bite (that means a big piece) of that pumpkin cake!! I make one that is pretty much the same, but I roll it. This looks much easier. I must try it! Yum....that cake looks so good...and the powdered sugar stencil looks darling. What a gorgeous looking cake! Thanks for sharing the technique with us. Have a great day. What a stunning stencil design - very nicely done! Aww you are so sweet! thank you so much! These cakes look SOOOO good! I'm dying for something sweet! PMS like a champ and those pictures did not help!!! Did the stencil come from pampered chef too? I love it, very pretty. Great idea...and the cake looks very moist and yummy...I'll bet that cream cheese ribbon gives it just the right flavor kick. I always wondered about how to create those stencils... it looks so beautiful and so simple. I'm gonna give it a whirl! thanks for the good tip! I love the idea of the stencil on top, and with the cream cheese WOW!!! 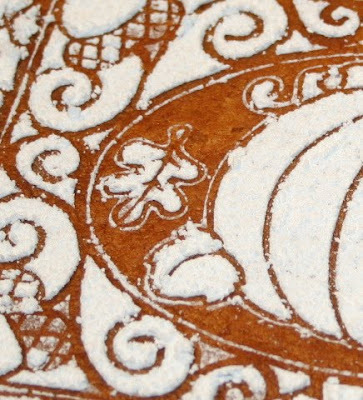 Your powdered sugar design on the cake is just gorgeous. 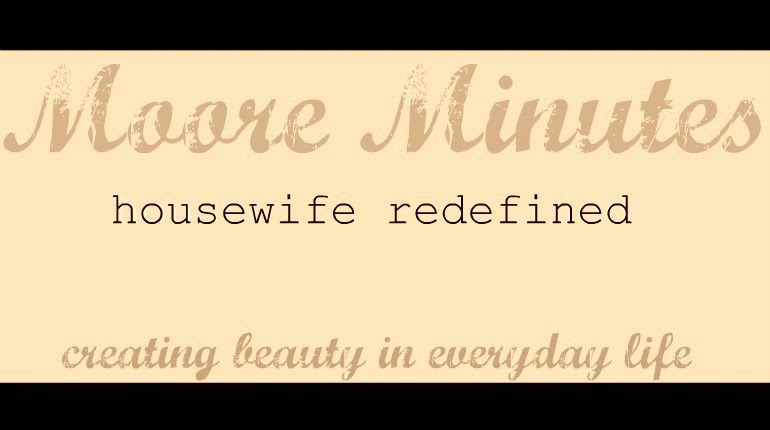 Makes me want to rush out to the kitchen and make a cake just so I can make it pretty like that :) Thanks for the inspiring idea. Wow! Love those recipe ideas and the powdered sugar stencil. How much fun is that!! I jumped on this am to see the post above this one. 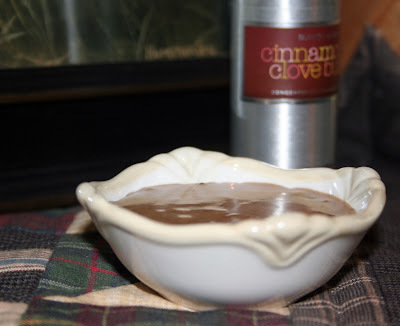 Then I noticed that picture of the Cinnamon Cream Syrup... Stopped me dead in my tracks. Did I mention wanting pancakes tomorrow? oh my! I'm definitely going to have to try your pumpkin ribbon cake!....and those acorn cookies were too cute in your farewell to fall... Thanks for sharing! Although I can't acknowledge with all you staded, I must acknowledge I do really like your way of composing. Thanksgiving Table 2009 and the Kid's Table too!